Iron loss in transformers is the combination of hysteresis loss (Ph) and eddy current loss (Pe). This type of loss mainly occurs in the magnetic core of the transformer, and depends on magnetic properties of core material. kh = It is a constant which is proportional to the volume, quantity of the core material and the units used. ke = It is a constant which is proportional to the volume, resistivity of the core material, thickness of laminations and the units used. Bm = maximum flux density in the core. f = frequency of the alternating flux. The exponent 'x' is called Steinmetz constant. Depending upon the magnetic properties of the core material its value varies from 1.5 to 2.5. As we know that the voltage applied is approximately equal to the induced voltage in the transformer. The above relation shows that the hysteresis loss depends upon both the applied voltage and frequency. The above relation shows that the eddy current loss is proportional to the square of the applied voltage and is independent of frequency. 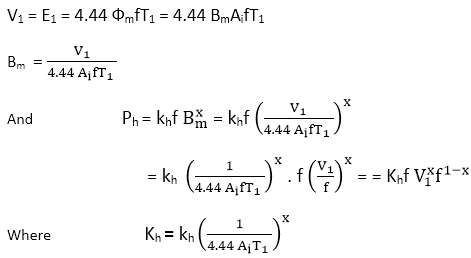 Which means for any voltage if f decreases, Bm increases. Similarly, if f increases, Bm decreases. The loss which takes place in the primary and secondary winding of the transformer because of the winding resistance is called the Copper loss or I2R loss. Therefore copper loss varies as the square of the load current. Eddy current in the conductor, tank, etc., produced by the leakage flux in a transformer is known as stray losses. We can neglect these losses, as the percentage of these losses is very less as compared to iron and copper loss. The losses that occur in insulating materials, i.e., in the transformer oil and the solid insulation of the transformer, are known as a dielectric loss. This loss occurs only in high voltage transformer, and is very small so that we can neglect these losses.